A rather unusual lecture was presented by Shanta Rati Mishra at the recent Dance India Asia Pacific conference. She raised interesting points about general etiquette, quoting some well known experts of the west, like Emily Post, and then spoke of dancers and their need to follow etiquette. It was an interesting session, particularly for the young aspirants present. I am giving my own small take on this subject. Most dancers today are well educated and learn early on, to conduct their careers suitably. From writing letters to organisations to applying for scholarships to meeting aficionados, they know pretty much what to do. One need not emphasise elementary stuff like being polite, thanking people, and showing respect to elders and gurus. I truly appreciate the fact that many gurus have done a great job of instilling the idea of respect in their students. They greet senior dancers and teachers with namaste, touching the feet when it is an elder guru, seeking blessings, and so on in a very sweet way. The glaring converse among young musicians is something I find rather curious. Perhaps it is because most of the singers have no guidance from gurus (they are virtually pirates, learning each song from a different stalwart's recording!) and things go to their head rather fast when they take the stage. In the past as young dancers, we were expected to show reverence to all vidwans.... be it in the world of dance or music, or any other art. The etiquette of doing namaste must be strongly encouraged. When I visited a high school in Bangkok to observe their dance classes, I went around with a teacher and at every turn, the students did a perfect namaste (as only the supple Thai fingers can articulate) to the teacher and to me when I was introduced. Nowadays in India I find many people including artists not doing the namaste but raising their right palm to their chest. Where did this come from? I wonder. It is neither a salaam nor a namaste but some fudged gesture. I recall that a politician held his palm against his chest when the national anthem was played and got into some trouble. I wish all schools all over the country tell the students to do namaste to teachers. It is beautifully Indian and if the Thais can do it we can too! And dancers who can hold the Anjali hastha very well can be the leaders of their peers. "Talking the dance" can be tricky. There are a gamut of compliments and criticism aimed at fellow artists. I personally think the first is always welcome, while the second is mostly unnecessary. One can always keep opinions to oneself because this world of dance is so small and a "live and let live" policy is advisable. This is most important for up and coming artists. To focus on their own work should be their main concern. Now the internet seems to spawn a lot of lack of etiquette. Dancers seem to relish attacking other dancers. Where does it lead? Nowhere, if you ask me, because an artist’s worth is established only by his or her own work. Shadow boxing on the internet is truly not a good idea. This applies to so called critics too who do not write about a performance but comment on all other matters. The dancer’s courtesy to her orchestra, and her audience is of prime importance. Most dancers observe these courtesies well. Some extend their thanks to various people who made the show possible. Others acknowledge the organiser. And so on. While this is appreciated, I feel when it is over done it can be a bit embarrassing. The supply being far too much beyond demand, dancers naturally feel obliged to be conspicuously grateful. No harm, so long as it is done with some reticence. Now to the explanations and introductions to each dance. This is the order of the day. However, brief notes read out clearly are appreciated. A panting and puffing dancer at the mike is always handicapped. Dancers must choose a suitable compere if possible and work on details. Pronunciation of ragas and names of composers when fudged provide unintended amusement. It is also necessary for dancers to know that some very common items do not need explanations at all in places like Chennai or Bangalore. For example a lengthy explanation of Krishna nee begane baro is quite annoying. While dress sense and costume functioning are not exactly within the realm of etiquette, it is wise to pay proper attention to these details out of courtesy to those who have taken the trouble to come. Nowadays programs are very short so there is no intermission as it was enjoyed in the days when such events were fewer. What is more, the dancers want to use every second to show their talent so there is no dress change either. There is also this lurking fear that the audience will depart if a five minute break is taken for costume change. I think, for the purpose of aesthetics, if the costume is dripping with perspiration, it is good to take a break and change. Today we live in a modern world, so gurus cannot exert their influence on dancers beyond a point. It is no longer the era of Rukmini Devi who prescribed dress codes which incidentally is still followed by students of Kalakshetra. There was a time when well established dancers could be identified with the amount of kajal they used to highlight their eyes off stage... yes, off stage. The trend was started I think by a famous dancer called Shanta Rao of Bangalore. She had studied Kathakali, besides Bharatanatyam and Kuchipudi. She used to apply very heavy eye makeup making her entrances majestically avant-garde. Many less eminent dancers followed suit, lining their eyes to look rather bizarrely theatrical. That is all out of fashion now. 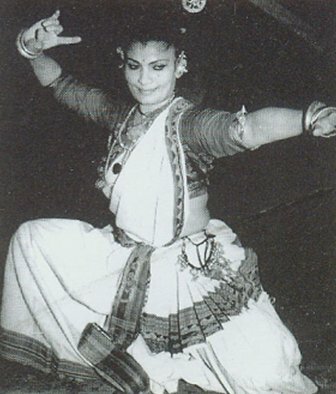 In those days, dancers dressed in sarees, preferably handloom, in shades of earthy colors. They also walked gracefully and held themselves always in the right posture. In fact people could identify a dancer in a crowd by the way she carried herself. All this has changed... I see dancers looking like "plain Janes" off stage. Young male dancers too look badly groomed. Girls dress casually, sometimes even clumsily. Their walk is governed by the jeans they wear. If they are "global" they have the additional burden of carrying a big school bag. Their postures are bad and they generally look scruffy and unattractive. What to do! Social etiquette applies to all artists. I think our culture dictates all that is required of us and one need not go far to learn the finer aspects. I personally think that a conscious effort to present the best of oneself at all times is not a serious demand. A pleasant exchange, a courteous smile and observing some diplomacy regarding fellow dancers ...that is not asking for much! Thanks a lot for bringing out this topic! What I liked the most in your article was, "being cordial & compassionate to other dancers." In the current world of competition, we are losing the compassionate dancer in us! This is the current need of the dance community! Dressing socially, outside the dance domain, is often a personal choice! Dressing in jeans etc could possibly mean that dancers want to keep up with current generation, don't want to be an odd one out & make a statement that dancers not only can be traditional but also hip & happening! So well written as always Lakshmi-ji. Most enjoyable sugar-coated pill.